The Summer of Arcade is once again here! For anyone unfamiliar with the Summer of Arcade, it is usually five games released over five weeks (though this year it is only four), to celebrate not only summer, but the best of the Xbox Live Arcade. Previously the promotion has seen the launch of some of the best Arcade titles ever released, including Limbo, Trials HD, 'Splosion Man and Bastion. It's a great time to be a gamer, and you know you're going to be treated to some top notch indie gaming. 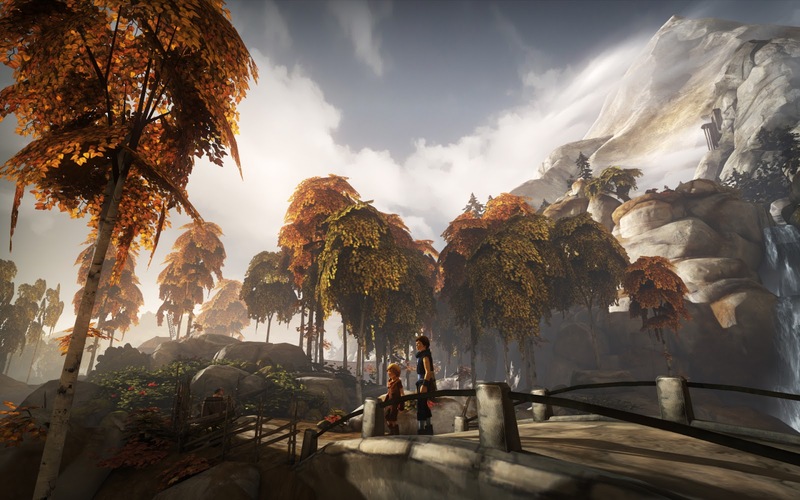 The title to kick off the Summer of Arcade this year is Brothers: A Tale of Two Sons. Does it deserve it's place in the line-up? Read on to find out! Brothers is the story of two young boys on a quest to save their ill father. Their mother recently died in a boating accident, and the younger of the brothers, who was with her at the time, is still not over the death. As the game begins, the younger brother is having a flashback to the accident, whilst visiting his mother's grave. All of a sudden, the older brother arrives, needing his brother to come with him urgently. You find the father, who can't walk and is clearly in bad shape, and this is where you step in. You control both of the brothers, the older brother with the left analogue stick, and the younger with the right. You can also make them interact with objects and people by using their respective triggers. That's all the need to control the game, the sticks and triggers. The bumpers control camera movement, but it generally doesn't move very much so it's easy to forget about that feature altogether. It can get a little confusing when you're trying to control both of them, and the wires in your brain will probably get crossed a lot as you try to remember which analogue stick is for which brother. Generally though, it works, and it introduces a whole new way of playing. That means that there are puzzles that would never be possible in a single player game, and they're so much fun to complete. The great thing about Brothers is that they don't speak English, nor is there any text on screen at any time, telling you what to do or where to go. You must figure it out for yourself, and it's credit to the development team that at no point when playing this game, did I get lost or confused by what was going on. The story is told by simply having characters interact with one another. It doesn't matter that you don't know what's being said, you can easily decipher it. Show a villager your map, and he'll point you in the direction you need to go. Play a prank on some unsuspecting villagers and they'll either shout or laugh. There is so much to interact with in this beautiful world, and so many things that you could miss. Whilst traversing the long path to the unknown destination, you'll pass a field with some rabbits playing in it. There is one single white rabbit who is being left out of the fun. You could simply walk past this and not give it a second though, or you could investigate. Upon further inspection, you'll see that you can pick up the white bunny and rub it in some coal, and suddenly, it's accepted by the other rabbits and it's so damn happy! There are some many of these magical moments that just make you want to cry with pure happiness. It sort of feels like Ico, both in the tone of the game, and the world that these brothers live in. You'll do a hell of a lot in Brothers; reunite a troll and his wife, fend off wolves in the night, use a Da Vinci-esque flying machine, creep through mines filled with angry trolls and so much more. And those are just part of the main adventure. On the side you'll do even more, which range from pranks and jokes to helping villagers out with small tasks, and even saving a man from killing himself. After the mine section of the game, things do take a dark turn. Running through a forest by torch light reveals a group of people who have taken their own lives by hanging themselves. The dancing flames cast flickering shadows of their lifeless bodies against the trees and bushes behind them. It's such a creepy, goosebump-inducing moment. After you have survived the night, there is another side path (again, which can be completely ignored should you choose to), leading to a little tree house. If you choose to go to it, you'll see a man with a noose stood on a stool under the tree, and before you know it, he's stepped off the stool. You have to act fast, and if you successfully save him, you get a chance to look around and you'll see why he did it. It's so damn heartbreaking, and it hits especially hard when you remember that these are two young boys, having to deal with such huge situations. You'll visit a variety of places, from mountains to caves to lakes. The world that Brothers is set in is one of the best looking worlds ever seen on an XBLA game. The graphics are mindblowingly good, and definitely show some retail games how it's done. It's a huge, consistent world filled with things to see and do, secrets to discover and interesting characters to meet. There are animals, waterfalls, lakes, huge mountains and deep ravines. It's one of the most beautiful game worlds I've ever seen, and it is literally perfect for this adventure. The music is just as spot-on as the graphics. A hauntingly beautiful score accompanies you on the quest, and it creates such an amazing atmosphere. 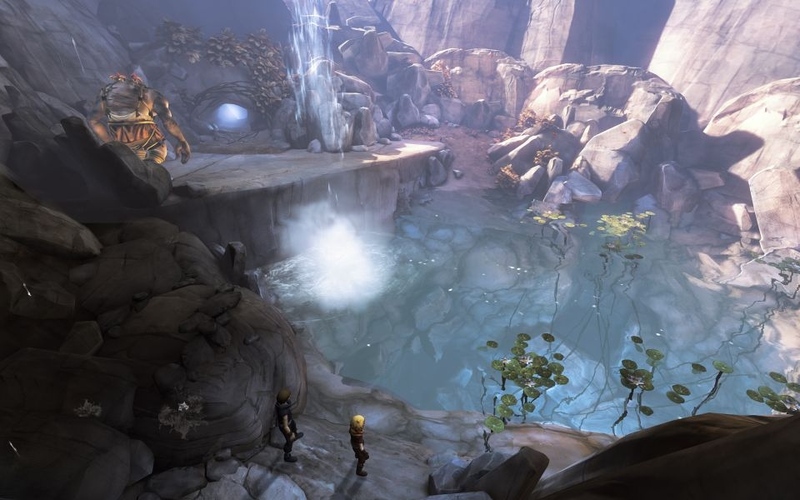 Brothers: A Tale of Two Sons is my new favourite Xbox Live Arcade game. It reaches a level of quality that not many do, and sits atop a perch with the classics mentioned earlier. It's hard to see any other XBLA game this year being as beautiful, emotional and innovative as this. If you're a fan of adventure and puzzle games, this is definitely for you, but even if not, you should check it out. It's one of those games that will stay with you for a very long time. It may be short, but so are some of the greatest works of literature, and the best movies. The length of the game does not detract from the experience, and it's potentially the most special gaming experience you'll have this year.